Professor James Forman Jr. has written many law review articles, in addition to op-eds and essays for the New York Times, the Atlantic, the New Republic, the Nation and the Washington Post. His first book is the critically acclaimed, Pulitzer Prize-winning Locking Up Our Own: Crime and Punishment in Black America (2017), which explores how decisions made by black leaders, often with the best of intentions, contributed to disproportionately incarcerating black and brown people. Locking Up Our Own is a book so compelling that it was named one of the New York Times’ Top 10 books of 2017, was longlisted for the National Book Award and became an instant Washington Post bestseller. In his memorable keynote, Forman shares his life journey as a child of a civil rights leader, a public defender, a founder of a charter school for incarcerated teens and a law professor. He outlines America’s criminal justice crisis with both data and human stories. He leaves the audience inspired and armed with concrete ideas for how they themselves can contribute to change. Purchase your tickets by registering on the Tacoma Arts Live website. 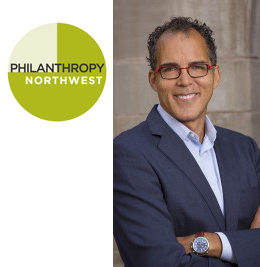 Discounted tickets cost $10 for Philanthropy Northwest members and employees of nonprofits. Contact Mares Asfaha to get your discount code to enter when making your purchase online. Tickets for the general public cost $29.75. Thanks to our sponsoring partners for this event, Tacoma Arts Live, Casey Family Programs, and The Bamford Family Foundation. The Racial Equity Speaker series consists of events throughout the year with speakers highlighting national and regional equity issues.